I have been all over the Cross House, from the deepest reaches of the canavorous basement to the scary heights of the highest roof. I have carefully vacuumed every horizontal surface, touched every window, and peered into countless hidden spaces and voids. I have discovered features which I did not initially know about (like an entire bathroom, hidden behind a door), a beautifully detailed laundry chute (also hidden behind a door), and a speaking tube system. I have discovered features which have long been gone (like the lost dumb-waiter and lower laundry chute). In short, the Cross House and I have developed an…intimate relationship. Therefore, one would think that the house could no longer surprise me. One would think. 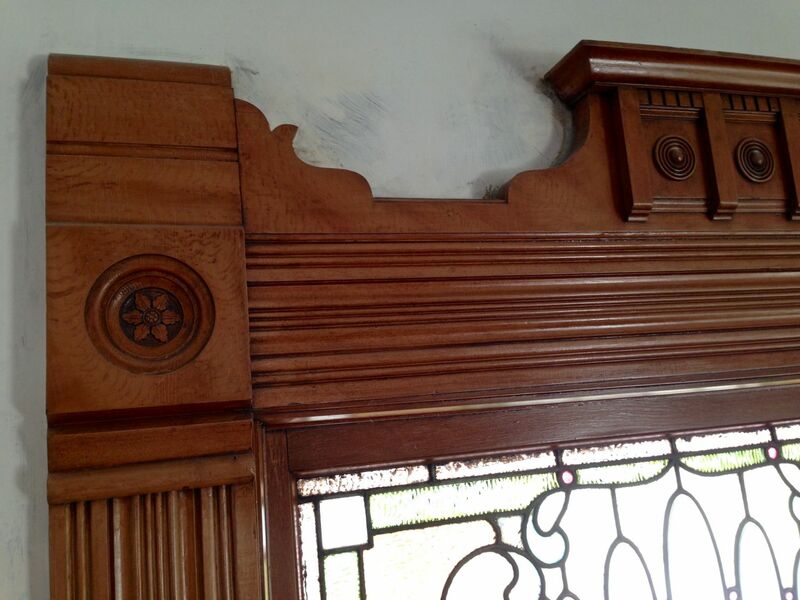 The above image is the upper window trim in the parlor. Earlier in the year it was covered with ancient alligatored shellac and was dark and scummy looking. Wholly by accident I discovered the original faux wood finish. That was a big whoee moment. Well, see the corner bulls-eye block? See the star? 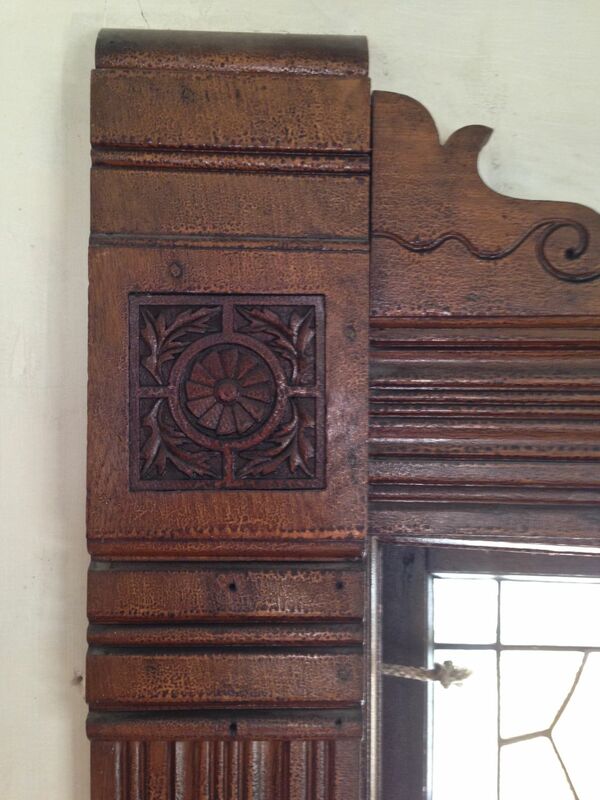 This is the typical corner block throughout the house, and the star is repeated on doorknobs and hinges. Cool. Such trim (and hardware) would have been ordered out of catalogs, such as this. The other day I was up on a ladder trying to seal a stupendous draft coming in above one of the curved windows in the round reception room. Then I saw the corner block. My eyes opened wide. Huh? What? Hey! Where did THAT come from? I looked around to the other two windows in the reception room. All the blocks matched. Then I stepped into the expansive foyer/stairhall. Oh. Gee. All THOSE blocks matched as well. Well, I am a dummy, for I never noticed that THESE corner blocks were unique in the house. Doesn’t it look like the blades of a windmill? Pin oak leaves too. You’re a lucky man Ross! The link does not work. I’d rather have Jeanie’s magic ponytail, hehehe! Wow, that is really cool! I see that the head casing has an additional carving in it too. 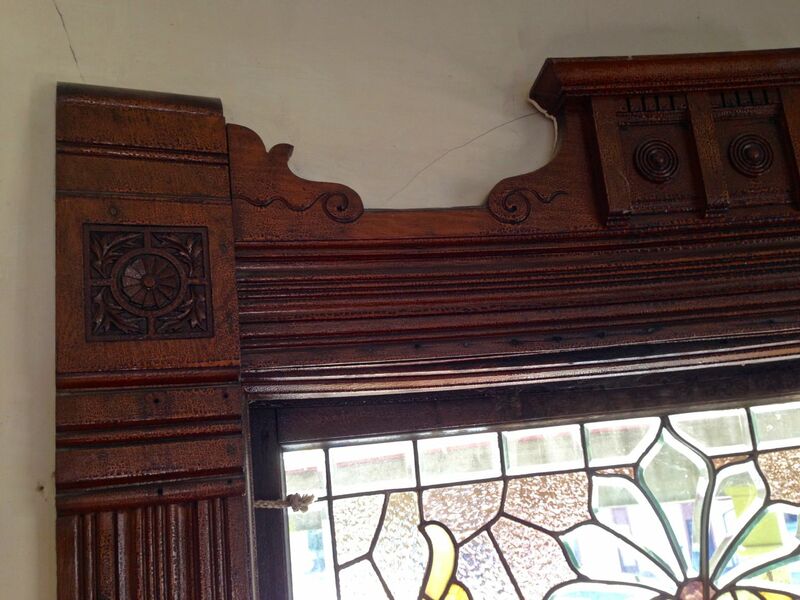 I understand these more intricate details are in more public parts of the house? Was this another example of putting the fanciest finishes where guest would see them, or perhaps just a small variation to match a different theme or decor in these rooms? Your email address will NEVER be made public or shared, and you may use a screen name if you wish.